SAILING Club members at the Cardington Village council meeting where they received permission to establish bird trails in the village and Maxwell Park. Shown are seated, from left, Aaron Howard, Todd Jolliff, advisor, Austin Vails, Savannah Hiett, Bree Deskins, Jaida Bahloul and Mrs. Jodi Adams, advisor. Council members standing are John Nippert, Jim Morris, Tim Abraham, Heather Deskins, and Nancy Edwards. Seated are Mayor Susie Peyton and Fiscal Officer Deb Fry. 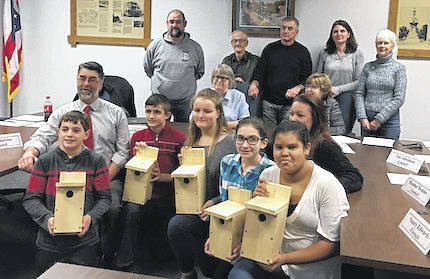 They came to the Cardington Village Council meeting and the Cardington-Lincoln Board of Education meeting carrying their hand-crafted bird houses. Cardington-Lincoln students in grades 5-8 have an added avenue of learning through the awarding of the 21st Century Community Learning Centers, a five-year federally funded grant that assists with the funding of before and/or after-school programs. It is through this grant that these students are developing a Bluebird Trail within Maxwell Park and establishing Purple Martin and Tree Swallow colonies within the village. This was the purpose of their visits by the students and their advisors to the two entities, both giving their approval to the venture. 21st Century Learning was developed with input from teachers, education experts and business leaders to define and illustrate the skills and knowledge needed by students to succeed in work, life and citizenship. It also offers the support systems necessary for 21st Century learning outcomes. The purpose, then is to extend the students’ learning day by providing academic enrichment activities that include tutorial services to help students meet state and local academic content standards in core subjects, such as reading and math. Cardington-Lincoln is using this grant to give students in the inclusive grades of 5-8 and their families an opportunity to use not only various school resources but also those resources and agencies in Morrow and surrounding counties. The Cardington Club, SAILING, is an acronym for Students Achieving Independent Learning In Necessary Growth. The club meets daily after school from 2:30 to 5:30 p.m. where a snack, computer time to increase skills in math and reading along with physical activity in the gymnasium is part of each students’ involvement. They also have time to receive both tutoring and help with homework. Advisor Todd Jolliff said they have also had the opportunity to enjoy the dress rehearsals of both the “Nutcracker” and “A Dickens Christmas” presented by the school’s Drama Department. Club members observed the Christmas holiday with various events and recently took part in an activity presented by a bird sanctuary. A harris hawk and a peregrine falcon were compared and contrasted in one session and a barn owl, in a second session. Tri-Rivers also visited with the SAILING Club to explain some of the aspects of aesthetics. There are various character building activities in which the students participate each day. They plan to develop the Bluebird trail within Maxwell Park and establish Purple Martin and Tree Swallow colonies within the village. By researching these three bird species and using mapping techniques, they decided on four locations within the village that present good nesting sites. This project has allowed the students to prepare a lumber list and shop for that needed to build bird houses. Each student laid out, measured and assembled a Bluebird/Tree Swallow house and will continue to do the same to build two Purple Martin houses. The Cardington Church of the Nazarene, the Village of Cardington and the Cardington-Lincoln Board of Education have given permission to place the houses on their properties. They plan to seek permission from Glendale Cemetery to place houses there. Advisors of the club are Jolliff, Pam Frysinger and Jodi Adams. https://www.morrowcountysentinel.com/wp-content/uploads/sites/29/2018/02/web1_SAILING-Club-at-Village-council.jpgSAILING Club members at the Cardington Village council meeting where they received permission to establish bird trails in the village and Maxwell Park. Shown are seated, from left, Aaron Howard, Todd Jolliff, advisor, Austin Vails, Savannah Hiett, Bree Deskins, Jaida Bahloul and Mrs. Jodi Adams, advisor. Council members standing are John Nippert, Jim Morris, Tim Abraham, Heather Deskins, and Nancy Edwards. Seated are Mayor Susie Peyton and Fiscal Officer Deb Fry.